In Part 1 in this “Making Sense of Jazz Theory” series we looked at 3 foundational concepts: the 4 Chord Families, Diatonic Harmony, and the Church Modes. If you haven’t checked that out yet, Click Here to read that first. 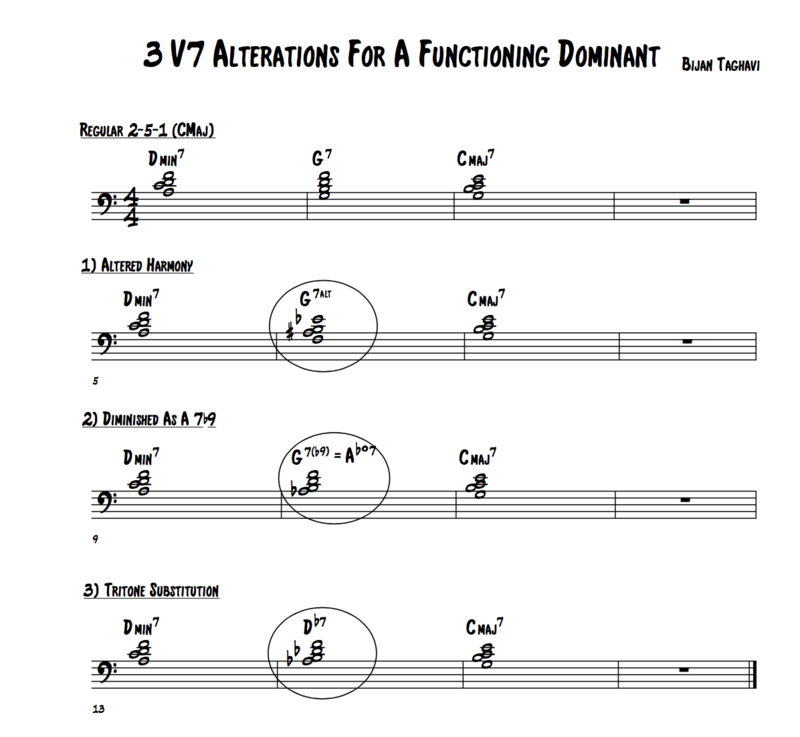 Today we are going to be looking at the importance of understanding Functioning Dominants and how that can lead to more advanced theoretical concepts or substitutions – such as: Altered Harmony, Diminished as a 7b9, and Tritone Substitution. A functioning dominant chord is a V7 that resolves down a fifth to its 1 chord. As we learned from diatonic harmony, the V chord is a dominant 7th chord, which contains the tense interval of a tritone between the 3rd and b7th of the chord. The tension created makes a dom7 want to resolve to the 1 chord. So for example: G7-Cmaj7 or G7-Cmin7 is a functioning V7-1. However, G7-Fmaj7 is not functioning because the V7 (G7) is not resolving to it’s 1 (CMaj or Cmin). This non-functioning G7 is referred to as a static dominant. Once we’ve identified a functioning V7, we can apply a few different techniques to make the V7 even tenser for a stronger tension-release. Altered Harmony allows us to add the b9, #9, b5, and #5 to a functioning V7. G7 Altered includes the root, 3rd, 7th plus the altered notes (b9, #9, b5, #5). So the G7 altered scale is as follows: G(1), Ab(b9), A#(#9), B(3), Db(b5), D#(#5), F(7). With the correct enharmonic spelling: G(1), Ab(b9), Bb(#9), Cb(3), Db(b5), Eb(#5), F(7). Interestingly, this results in the melodic minor scale starting from a semitone above the root. So G7Altered = Ab Melodic Minor. The 3rd, 5th, 7th, and 9th of a G7b9 make up the notes B D F Ab which is an Ab diminished chord. Tritone substitution allows you to take any functioning dominant and substitute a functioning V7 with a dominant 7th chord a tritone (#4/b5) away. For ex: Dm7-G7-Cmaj7 – tritone sub allows you to sub that functioning G7 for a Db7. This is because G7 and Db7 share the same 3rd and b7th (F & B), which are the defining characteristics of a chord.